Somewhere along the way you probably have run across the notion that some folks are “right brained” while others are “left brained”. The basic theory is that the two different sides control two different “modes” of thinking and that each of us has a preference of one mode over the other. However, with a few of us, neither side is dominant and there is more balance in our ways of thinking. The right brained folks seem to have the most problems with organizing. They tend to be . . . ahem . . “creative types ”. They can pen a complete opera on the back of a chewing gum wrapper during their lunch break but their tax return is two years late because they can’t find the necessary documents and receipts. I share an office with my daughter who is a CPA and I see folks like that more often than you would imagine. WOW ! Right brained folks do better when all their “stuff” is in full view and at their fingertips, while left brained folks do better when their stuff is stacked, labeled, sorted, color-coded and filed away according to a logical system. When the need arises to retrieve something, left brainers refer to logic and the “system” inside their head to help them figure out where something is or where it should be.. Mind you,they often times don’t really remember where something is, they simply look up the code in their left brain “system” and this tells them where to look. With the right brained folks, if it is out of sight, then it is out of mind and conventional checklists and filing systems just do not feel natural and therefore don’t work very well for them. The right-brained person usually has a strong visual sensibility and is more likely to be much, much more engaged with their environment than the left brainers. They tend to take a “big picture” view of the world with little interest shown in the details or whether or not the folder is in the right slot. That’s why the right brainers need to be surrounded with a rich visual environment. A clean, neat organized desk is simply not a visually rich enough environment for them to feel comfortable. However, they can still use a few of the left brainer systems if they will keep things out in the open and within fingertip range. Things like literature sorters, colorful file folders, magazine holders, binders and portfolios, project file boxes, desktop step files, stacking trays, etc. all usually fit in well with the right brain folks just like with the left brained folks. This way, things are organized but still handy and in sight and can be accessed and understood with right brained thinking. Left brainers would probably use these same products but would probably not have them in fingertip range. The left-brainer does better in a structured environment with a well ordered workspace. Distracting visual elements and non-active folders and projects need to be sorted and stored away except for the task immediately at hand. Left-brainers do best when a logical home has been established for everything. ( you may remember some of my previous tips where I suggest that everything have a proper keeping place). Divided desk drawer trays, wire step files, color coded systems, and labelers all give them a way to reduce the stress of a messy desk or office. Be you left brained or right brained, there is there is no right way or wrong way, no cookie cutter “exact” way to organizing – it’s simply coming up with a system that works for YOU! However, for the right brainers, the goal isn’t so much to be neat and orderly but to be functional. If you can find what you need when you need it, you are organized regardless of how messy your desk may look! 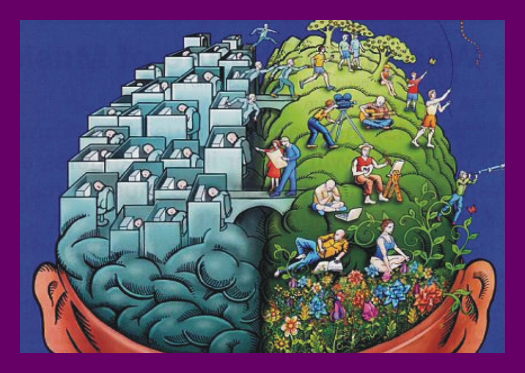 From a right brainer living in a left brain world – good luck on organizing. Next Post: Leave home without it!